This is in response to Lobsang Sangay la’s public response to the criticism made on his green book contribution and also, on his travel to China on IC. I was hesitant for the past few days whether to write this piece of response or not. The hesitant grew out of the concern that some may intentionally or unintentionally tag me as a cheerleader of Tenzin Namgyal Tethong la or other Kalon Tripa candidates. However, since the public interest started to gain momentum in the Kalon Tripa election, I have been more concerned about the process or the development of our unique democracy in-exile. I realized it is more important to be a responsible citizen first than a supporter of any candidates. We do not want to erect a nation of democracy where the essence of ethics are lost. In addition, we do not want a carbon copy democracy of India, Nepal, or the United States. We need to create our own unique democracy where differences are respected, values are maintained, criticisms are embraced, and unification is the end goal. So, my hope is that this response is a one small step towards the development of this unique Tibetan democracy. Coming back to Lobsang la's response, I highly appreciate his commitment, dedication, and responsibility shown towards the greater interest of the general public. His noble act of submitting the present response is a perfect example of what our Central Tibetan Administration has been advocating for i.e., the importance of transparency. However, I felt Lobsang la's response inconclusive and evidences lacking self-explanatory. I am saying this after looking at the two questions posed by Sonam Topden la, Toronto, Canada on November 21, 2010 addressed to TPR editors. The first question was “How LS got Chinese visa on IC?”. 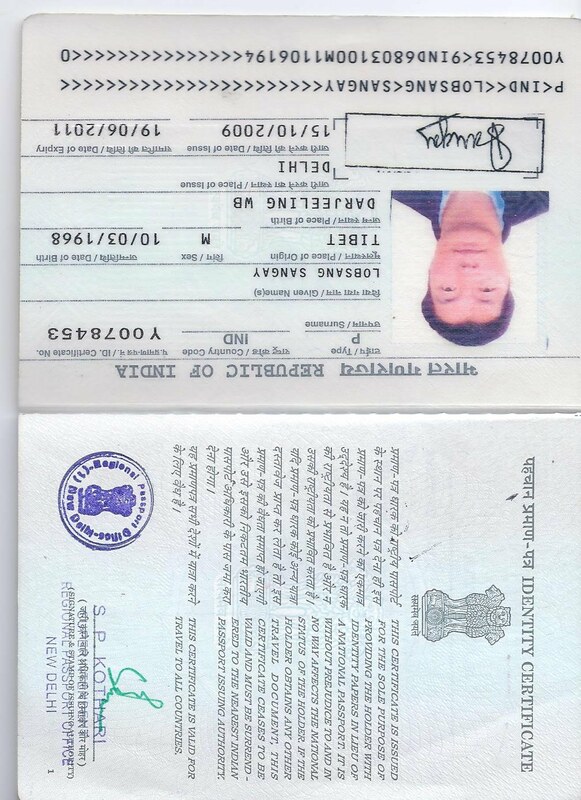 The attached copies of Lobsang la's Identity Certificate (IC) only helped me to understand that he traveled to India. It failed to clarify anything on his travel to China. Another explanation provided was on the pre and post visit consultation with the Kashag on his China trip. However, I felt this clarification again failed to answer the question either. If I nailed down correctly, Sonam Topden la was asking for the proof of Lobsang la's China travel on IC and not on the official or unofficial endorsement. I would definitely be convinced if Lobsang la provided a copy of his China visa. FYI – I could not find Samdhong Rinpoche’s public talk at Minnesota although I see it as irrelevant to the current discussion. The second question was on Lobsang la’s Green Book contribution. The letter from the Office of Tibet, New York City and Boston Tibetan Association did helped to clarify that Lobsang la paid Green Book during a certain period of his stay in the United States. However, the letters failed to specify Lobsang la’s Green Book contribution prior to 1999. So, the letters were not comprehensive enough to draw the conclusion that Lobsang la paid his green book throughout his stay in the United States. Finally, my observation may not be right. Therefore, if I am wrong, I am willing to take slaps on both of my dry cheeks. Again, my response can be viewed as half-full or half-empty glass. It depends on which one you chose to go by. Thanks.